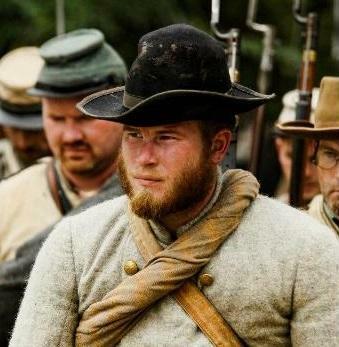 To mark the 150th anniversary of the end of the Civil War, we speak with historian and Civil War re-enactor Phillip Brown who is retracing the steps of Confederate Navy Sailor Washington Duke. Duke was a tobacco farmer when he was joined the Confederate army in 1863 or early 1864, due to a shortage of troops. He was captured by Union Forces and imprisoned in Richmond, Virginia. Eventually, he was shipped to New Bern. When the war ended, Duke was released and he walked 135 miles back to his home in Durham, because he didn’t have money or transportation. Historian Phillip Brown embarked on his commemorative journey “A Soldier’s Walk Home” on Monday. He’s planning on making stops along the way in Goldsboro, Smithfield, Clayton and Raleigh before reaching his destination by the end of the month. Public Radio East’s Mac McKee caught up with Brown this Wednesday as he was passing through Lenoir County.